SatTrackCam Leiden (b)log: [UPDATED] USA 129 de-orbitted [NO!]? And USA 186 about to manoeuvre? [UPDATED] USA 129 de-orbitted [NO!]? And USA 186 about to manoeuvre? UPDATE 04 Feb 2014: USA 129 was NOT de-orbitted! Greg recovered it on Feb 3. It appears to have manoeuvered into an orbit with a much lower perigee. More here. 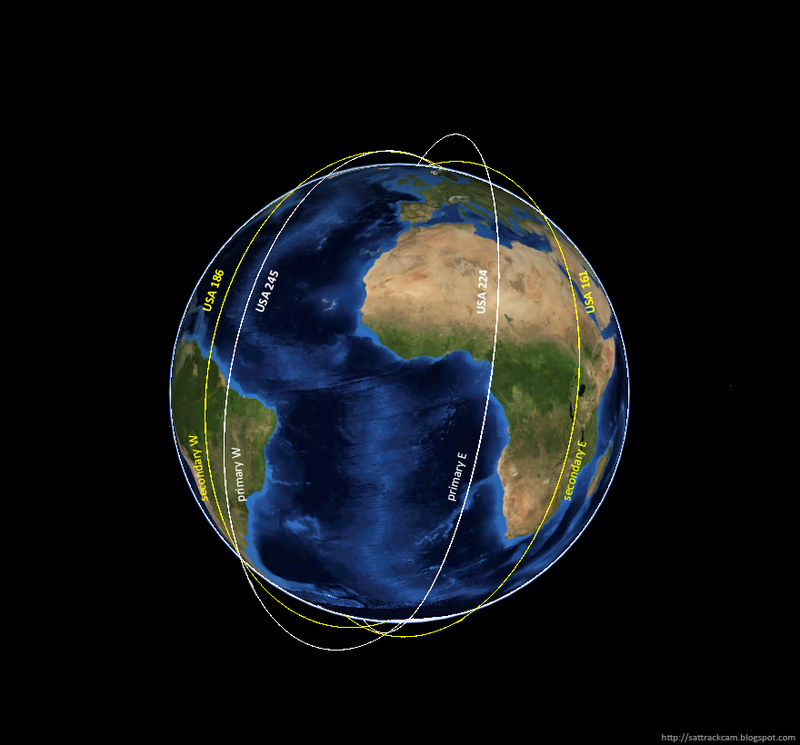 USA 129, the oldest orbiting member of the KH-11/CRYSTAL optical reconnaissance satellites, appears to have been de-orbitted during the past week. 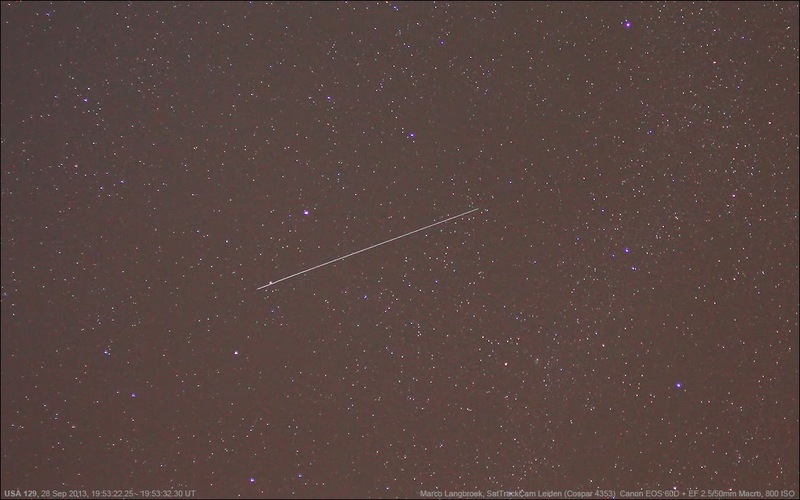 On January 27, Greg Roberts in South Africa observed USA 129 (1996-072A) and USA 186 (2005-042A), two of the west plane KH-11 satellites. When he observed again on January 30, USA 129 was gone. He could not spot it on two good passes that evening. A de-orbit fits into expectations. In September and October, I published a number of analytical posts on the past and future of the KH-11 KeyHole/CRYSTAL constellation. 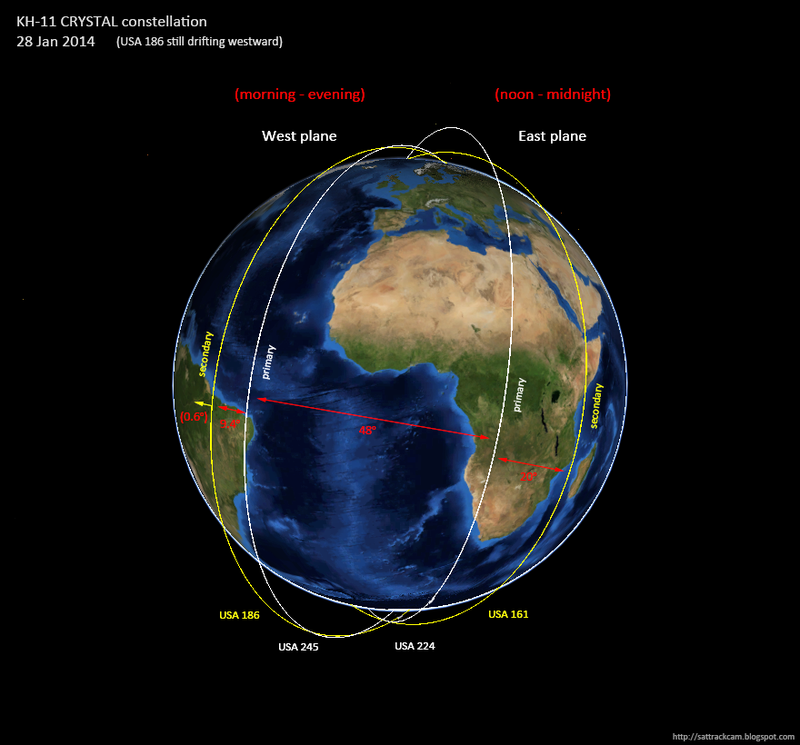 They detail how I think/thought the constellation of KH-11 satellites will be re-arranged following the lauch of a new satellite, USA 245 (2013-043A, NROL-65), into the primary West plane of the constellation on August 28, 2013. The two most pertinent of these posts are the ones here and here. So far, my predictions seem to have been quite in line with what consequently actually happened. I suggest that this week will see the closing overture of this spatial spy satellite ballet. I earlier predicted that after a few months of checkout of the newly launched USA 245, the older USA 186 would be moved from the primary West plane to the secondary West plane, by shifting the RAAN of its orbit 10 degrees more westward. In doing so it would take up the position formerly filled by USA 129 during its extended mission. I also predicted that USA 186 will at some point drastically lower apogee, slightly raise it perigee, and circularize it's orbit. I in addition expected USA 129, which was over 17 years old, to be de-orbitted near the moment those goals were attained. The latter (the de-orbit of USA 129) seems to have happened in the past few days. So far USA 186 has also been keeping to the plan. In mid-November 2013 (on or near 12 November), USA 186 made a manoeuvre that changed its inclination by 1 degree (see my post here), causing the satellite to temporarily lose sun-synchronisity and causing it to gradually drift in RAAN from the primary West plane towards the secondary West plane. It is nearly there now. 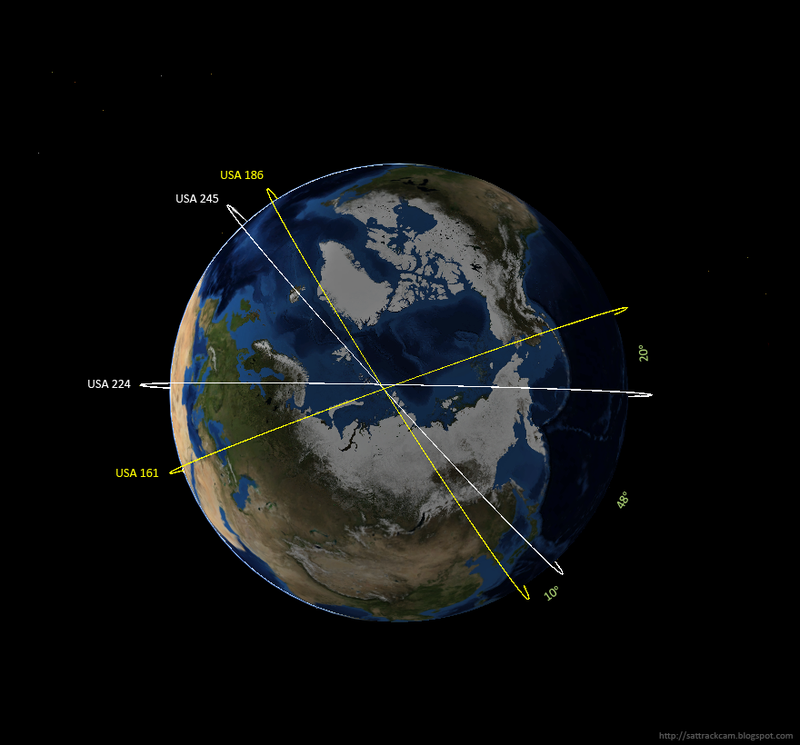 At the current drift-rate (delta 0.12 deg/day relative to the sun-synchronous drift value of the other KH-11 satellites), it will reach the former orbital plane of USA 129 and a 10-degree separation in RAAN from USA 245 (now the sole satellite in the primary West plane) within a week from now, on February 6, 2014. The image above shows how as a result of the Nov 12 manoeuvre, the orbital plane of USA 186 gradually drifted (and as of this writing on Feb 1 still drifts) from the primary West plane to the secondary West plane between November 12, 2013 and February 6, 2014. This is exactly what I predicted to happen back in September and October. The next step is that I expect a large manoeuvre by USA 186 on Thursday February 6th, in which it lowers it's apogee (currently at 975 km) to ~390-400 km, and slightly raises its perigee (currently at 260 km) to ~380-390 km, attaining a much more circular and on average lower orbit with eccentricity close to 0.00055 (currently 0.05) and Mean Motion near 15.59 revolutions/day. The current orbital inclination of 96.91 degrees is already very close to the 96.99 degree value with which such a 390 x 400 km orbit is sun-synchronous. Lowering apogee and perigee to these values hence would restore a sun-synchronous orbit and stop the drift in RAAN relative to the other satellites in the constellation. As such, the 1 degree inclination change in the satellite's orbit introduced mid-November might be a strong clue that indeed a 390 x 400 km orbit (similar to USA 161, in the secondary East plane) is intended. The image above shows the KH-11/CRYSTAL constellation as of 28 January 2014, and excluding USA 129 which was de-orbitted on or very shortly after that date. The small yellow arrow perpendicular to the orbital plane of USA 186 indicates that I expect it to shift by an extra 0.6 degrees over the coming week. As a caveat, there is a very small, alternative possibility that USA 186 will not manoeuvre on Feb 6th. In that case, it will keep drifting another 2.5 months untill the RAAN (orbital plane) difference with USA 245 reaches 20 degrees (and the RAAN separation of the outermost, secondary E and W planes 90 degrees). My hunch is however that this will not happen, and USA 186 will manoeuvre on Feb 6th into a sun-synchronous orbit with RAAN 10 degrees from the RAAN of USA 245, as explained above. Note: many thanks to Greg Roberts, South Africa, for keeping an eye on the KH-11 satellites during the Northern hemisphere winter blackout! USA 129 does a Mark Twain!